Russia, officially known as the Russian Federation, is the largest nation in the world, and spans the northern parts of the Eurasian continental land mass. It is bordered on the north by the Arctic Ocean, on the east by the Bering Strait, the Pacific Ocean, and Alaska, on the southeast by Mongolia and China, on the southwest by Kazakhstan, Azerbaijan and Georgia, and on the west by Ukraine, Belarus, Latvia, Estonia, and Finland. Russia occupies an area of 6,592,771 square miles, and its capital city, Moscow, is situated in the western part of the country. To print this map of Russia, click on the map. After map loads, press Ctrl+P. About 80% of the country lives in what is called European Russia, an area that lies west of the Ural Mountains. 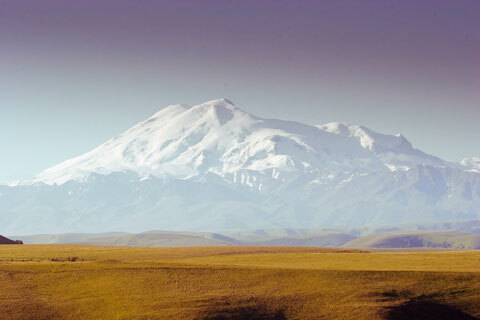 The land, which is mostly flat, rises to the Caucasus Mountains in the south with Russia's highest peak, Elbrus. Siberia has quite a different landscape, and while it is mostly made up of plains and plateaus, it does have mountains in the east and south. Russia has many active volcanoes in the far east, particularly in the Kamchatka peninsula. Russia is not only the largest nation in the world, it also has some of the world's longest rivers, including the Yenisey-Angara and Ob-Irtysh. One of the world's largest seas, the Caspian, is within Russia's borders, as is the world's deepest lake, Lake Baikal. Baikal is also known for harboring the world's only freshwater seal species, although the lake's ecology has recently been threatened by pollution. The Moscow area and much of western Russia enjoys warm summers and cold, snowy winters. South central Siberia has a colder, harsher, and drier climate, while northern Siberia has the harshest, coldest environment in all of Russia. Russia's primary cities are Moscow and Saint Petersburg. Moscow is the hub of the dramatic changes sweeping through the country. Wealthy capitalists of the New Russia and poor pensioners share the sidewalks, and modern office buildings adjoin medieval monasteries. The Kremlin, at the center of the city, is where the country's administration lives. Surrounding the Kremlin are Red Square, the Lenin Mausoleum, and the cathedral of Basil the Beatified. Saint Petersburg, sometimes called the Venice of the North, reminds visitors of the days of the czars, with its palace-lined waterways and grand architectural elegance. Located on the delta of the River Neva, St. Petersburg is a major Gulf of Finland seaport. In addition to being an important cultural and historical hub, St. Petersburg is the second-largest city in Russia. 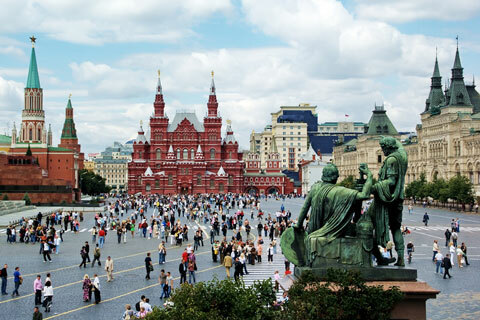 Popular tourist attractions in Russia include the Kremlin and the Red Square in Moscow as well as several fine arts museums, most notably the State Hermitage Museum in Saint Petersburg. For a tour of the countryside, visitors may travel across central and eastern Russia on the Trans-Siberian Railway. Gora El'brus, Russia's highest point, towers at 18,481 feet (5,633 meters). For more information about Russia and its government, visit the President of Russia website. Russian National Group - Russian visas, tours, cruises and excursions. CIA - The World Factbook - Russia - US Government almanac offers Russian geography, statistics and maps. Wikipedia - Russia - includes information about regions in Russia, Russian history and the geography of Russia. Russia News - News headlines and news article links about current events in the nation of Russia. Russia straddles the northern part of the Eurasian continental land mass; these maps of Europe and maps of Asia will provide some visual, geographical context for understanding Russia's location. Map-of-Russia.org. All rights reserved. About us.